A north west view of Rochester Cathedral in Kent. In particular it shows the unusually well proportioned Norman west front with its great Gothic Perpendicular window. Rochester is the second oldest ecclesiastical see to be founded in England. The Cathedral was rebuilt1077-1108 by the Norman Bishop Gundulf. During the early 13th century it was greatly enlarged with a second pair of transepts. It was low for a cathedral with a stocky tower topped with a short thick spire. 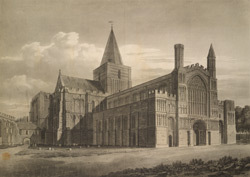 Daniel Defoe described 'an antient but not extraordinary cathedral' at Rochester when he visited in the early 18th century.